It was a good value - pricewise to amenity wise. I would stay here again. Roy who checked us in was really great. Hot tub should have been hotter. Property was fine, but I managed to be able to leave early and the front desk would not help me get a refund on the night was was not using. Lots of room space. This property is also right next to the airport. I liked the rooms also the free breakfast in the morning.I liked the jaquzi.I thought the staff was griendlyand helpull.Needed to keep coffee on hand 24 hrs a day.Overall well. Beautiful hotel and right next door to the conference center. Ontario Convention Center is within a 5-minute walk of Azure Hotel & Suites, Trademark Collection by Wyndham while other popular sites like Citizens Business Bank Arena are within a few miles (5 km). This 167-room, 3-star hotel welcomes guests with conveniences like an outdoor pool, a 24-hour fitness center, and free in-room WiFi. It's centrally located in Ontario, connected to the convention center,4.8 mi (7.7 km) from Ontario Mills Shopping Mall, and also 7.6 mi (12.3 km) from Claremont McKenna College. Free buffet breakfast is included with your stay and awaits you each morning from 6:00 AM to 9:00 AM. You can enjoy a drink at the bar/lounge or visit the onsite restaurant for a bite to eat. Savor a meal from the comfort of your room with room service. A flat-screen TV comes with cable channels, and guests can stay connected with free WiFi. Beds sport premium bedding and the bathroom offers free toiletries. Other standard amenities include a sitting area, a refrigerator, and a microwave. Guests of Azure Hotel & Suites, Trademark Collection by Wyndham have access to an outdoor pool, a 24-hour fitness center, and a spa tub. You can take advantage of free parking, along with a free airport shuttle (available on request). Multilingual staff at the front desk are standing by 24/7 to help with luggage storage, dry cleaning/laundry, and securing valuables. 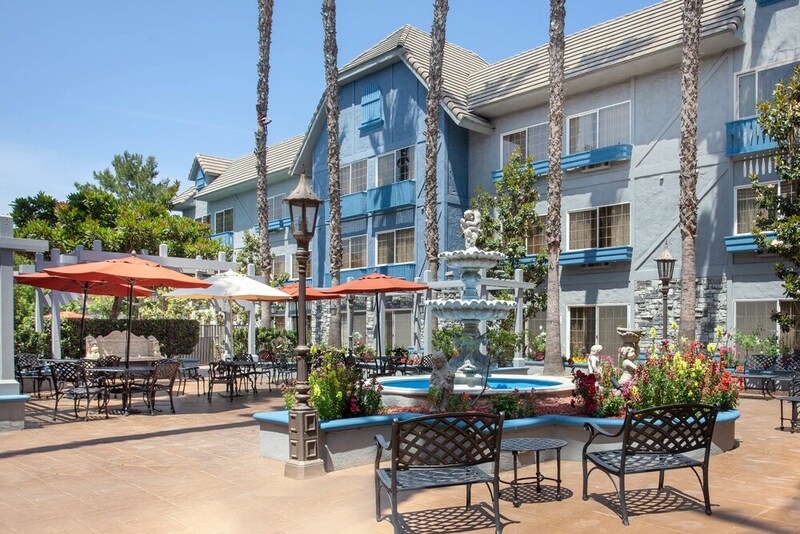 Additional amenities include free WiFi in public areas, conference space, and a 24-hour business center. Thank you so much for your review. We are delighted you enjoyed your stay! Thank you so much for your review! We hope you will be back soon. We are all so glad that you enjoyed your stay and hope you will be back soon. Thank you for your review! We hope you stay with us again! I am sorry that your experience at our hotel left some negative impressions. Thank you for your review. We hope you will be back soon. Free buffet breakfast is served daily from 6:00 AM to 9:00 AM. The hotel has an outdoor pool and a spa tub. Other recreation options include a 24-hour fitness center. The preferred airport is Ontario, CA (ONT-Los Angeles - Ontario Intl.). The front desk is open 24 hours a day. For convenient arrivals and departures, you can take advantage of the free airport shuttle (available during limited hours). Driving? This property offers free self parking, along with free RV, bus, and truck parking. Airport transportation is available on request from 4 AM to 11 PM. Fees may apply. Guests must make arrangements in advance by contacting the property. This property offers airport shuttle service 4 AM-11 PM. For more details, please contact the property using the information on the reservation confirmation after booking. This hotel provides transfers from the airport. To make arrangements, contact the property with arrival details on arrival, using the phone number on your booking confirmation.